Alright, no reason to hold it back: This device is absolutely amazing. There, I said it! A few days ago I got an exciting package on my desk. 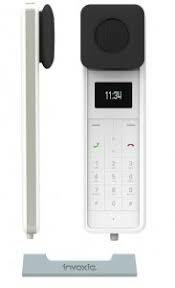 Two new IP phones all the way from France, from the relatively new company Invoxia. 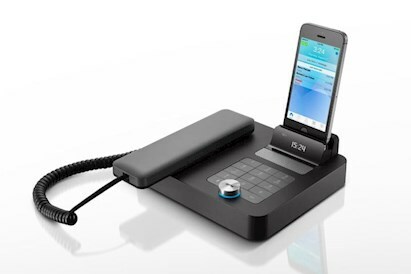 Both have in common that they are a hybrid between an IP phone, a cell phone dock and a music player. The really cool thing about that is, that even though you may have an IP phone on your desk, you most likely also have a cell phone – and a cell phone charger. 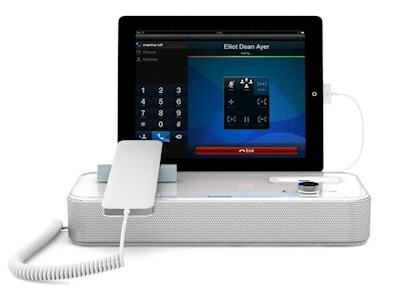 The Invoxia NVX 620 and NVX220 merge these two things together, so that when you’re by your desk, you simply park your cell in the dock, and it instantly turns into the display for the IP phone, while it charges – and plays music. Great! 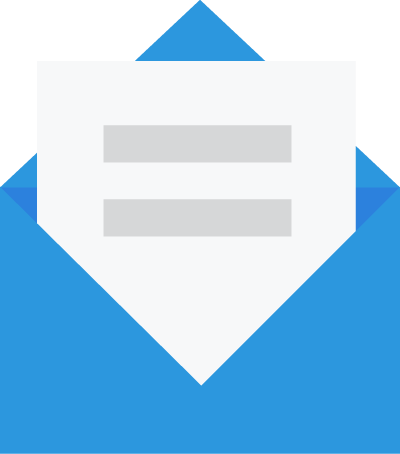 When you then either receive a phone call on your cell phone or your SIP account (your Telzio business number), the dock will stop playing music and play a ring tone instead. You can then lift the handset and answer the call – even if it’s a cell phone call. The smaller version, NVX220 that supports both iPhone and Android. Even better – it also connects to your cell phone via bluetooth, so when you’re within reach of the NVX 620, it still rings and you can talk through its handset or its speaker phone feature, even when your cell phone isn’t plugged in. The speaker phone feature is especially cool, because the sound quality in the phone’s speakers is absolutely amazing. 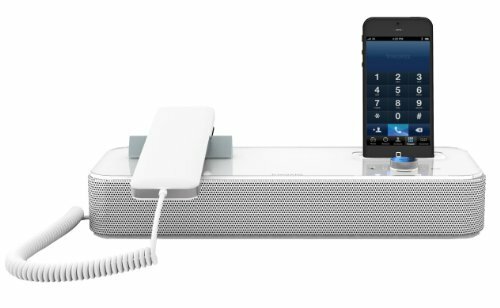 I have rarely heard an iPhone dock sounds that good, on both phone calls and when playing music. I guess I don’t need to talk much about the design – as you can see for your self, the French guys at Invoxia have injected a good amount of European design into this device. It’s slick, modern and robust. It doesn’t have that cheap plastic feeling that we’ve seen with similar products. While the smaller Invoxia NVX 220 only supports cell phones (both Android and iPhone), the NVX620 also supports tablets, and gives you the ability to make calls through a soft phone client (which comes for free with the phone) – suddenly your iPad is a phone, and when you’re not talking, you can use it as easy access to calendar and other productivity apps. This gives you an extra screen on your desk, that you will get to love from the very first day. The device works with both Telzio’s mobile app and the Invoxia app, which your phone will prompt you to install when you plug it in the first time. The Invoxia app allows you to install a SIP user on the phone itself, so even when you don’t have your phone plugged in, you can still receive calls. And the NVX620 even has a little display in the handset that shows the caller ID of the person calling you. The Invoxia NVX 620 comes at a rather high price point (retails for $599), but considering how much you actually get, the money is very well spent. Telzio is currently offering a discount on the device, and you can now save $100 and get it for only $499! The smaller NVX220 is also on sale, and can be yours for just $499.